Tipping is something most people in the U.S. do to show appreciation for a service rendered. However, there are times when it's appropriate and times when it's not. Do you ever wonder if you're expected to leave a tip, and if so, how much? Don't feel bad as this is a common question. Tipping for services has been a custom in the United States and other countries for centuries. It started as a way to ensure good service, and it has become an expected practice in many industries. However, not all cultures embrace tipping. Before you travel to a foreign country, it’s a good idea to do some research and learn the customs regarding tips. There are actually some countries where tipping is considered an insult. 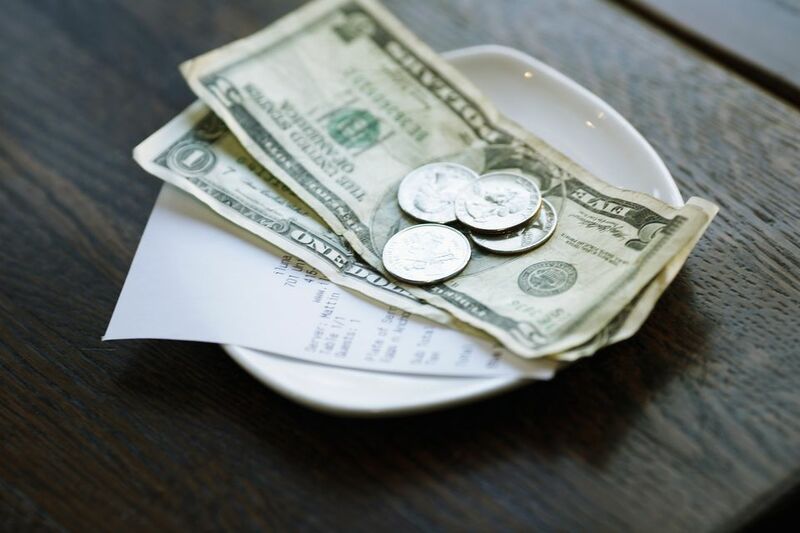 Most of the time in the U.S., tipping is at the customer’s discretion, but before you leave money, look at the bill and see if the gratuity has already been added. Remember that government workers are not allowed to receive tips. For those who aren't math whizzes, here is a handy online conversion: Tip Calculator/Conversion. You can also do a quick calculation on your cell phone calculator. If you don't have access to either, remember that all you have to do is move the decimal two digits to the left, and you'll have 10 percent. Double that for 20 percent. If you aren’t sure whether or not to leave a tip or how much to leave, check these guidelines. Leaving a gratuity is optional in most cases, but it can make a big difference in the server’s life. Don’t forget to also offer a verbal thank you for services rendered. In a full-service sit-down restaurant, the expected tip is approximately 15 to 20 percent of the bill before coupons, discounts, or taxes. If you are at a restaurant with buffet service, leave a 10 percent tip. There is no need to tip someone who simply shows you to your table. However, if you have made a reservation for a specific table, or if the maître d went to extra effort to accommodate a special request, you may want to tip $10 or $20. When handing this person the money, do it as discreetly as possible. Making an obvious gesture to tip this person is considered gauche. Good carryout service calls for a tip. If you drive to the restaurant and go inside to pick up the food, there is no need to tip. However, if someone brings the food to your car, you should tip 10 percent. Tip $2 to $5 for pizza delivery, more if the delivery person has to make several trips to the car. A tip of 10 to 20 percent is appropriate for delivery of all other foods to your home. When you sit at the bar, don’t forget to tip your bartender. You may leave $1 or $2 per drink, or if you are there for several hours, leave 10 to 20 percent of your total bill. There is no need to put money in a tip jar, but it’s a good idea to leave a small amount for good service. There is no need to tip the valet when you arrive. However, when the car is returned to you, the appropriate tip is $2 to $5. Hairdressers and barbers should be tipped 15 to 20 percent of the cost of services, and it is up to them to split it among others who assist. You’ll also want to tip 15 to 20 percent for a manicure, waxing, massage, or other services you receive. If you are doing a local move, tip at least $20-50 per mover, depending on the complexity of the move. For a long distance move, consider tipping more, especially if the move requires more than one full day. Car wash services vary. For a standard, assembly-line car wash, tip $2 to $5 to the person in charge. If you have your car detailed, tip 10 to 20 percent of the total price. When budgeting for a trip, don’t forget to include gratuities for services at the hotel. There’s no need to tip a doorman who simply opens the door. However, if the doorman hails a cab, tip $1 to $5, depending on the degree of difficulty. Pay him $2 to $5 for carrying luggage. When the bellhop arrives at your room with your luggage, pay $2 to $3 per bag. You don’t need to pay the hotel concierge for answering brief questions, but it’s a good idea to tip $5 to $20 for services such as securing tickets or reservations. Leave $2 to $5 per day for housekeeping. If you take a taxi, tip 10 to 20 percent of the fare. When you check your bags, offer the skycap $1 to $2 per bag. For wheelchair service, tip $5 to $10, depending on the degree of difficulty. When flying, some airlines encourage tipping the flight attendants, while others discourage it. If you plan to have drinks while onboard, check with the airline to find out whether or not you should tip. The type of golf course and cost of fees will influence the amount you should tip for services. Some municipal courses forbid tipping, so before offering money, check the policies of the facility. If tipping is allowed, the standard amounts are $2 to $3 for valet parking, $2 to $3 for bag drop, and $2 to $3 for cart return. If you purchase something from the beverage cart while playing, tip $1 to $2 per person. If you use a caddie, you’ll want to tip at least 20 percent of the fee charged by the course. During the holiday season, it's always nice to add a little extra to your tip. This is especially true if you've developed relationships with people who provide services for you throughout the year.